YouTube is a treasure trove of feel-good videos featuring children walking for the first time with the help of O&P devices. There’s 2-year-old Kayden, 1-year-old Samantha, and 14-year-old Zoe, who lost her left leg below the knee in a jet skiing accident. But these inspiring images capture only one moment in each child’s journey. What happens down the road as Kayden, Samantha, and Zoe mature and outgrow their devices? The need to replace an O&P device on a regular basis has its challenges for practitioners, patients, and parents. The patient who has just become accustomed to a device has to start all over. Parents want the best for their children but know these replacements can come with a hefty price tag. And that means the practitioner must attempt to optimize fit and function for the moment, make adjustments over time if possible, and, ultimately, determine when a completely new device is necessary. 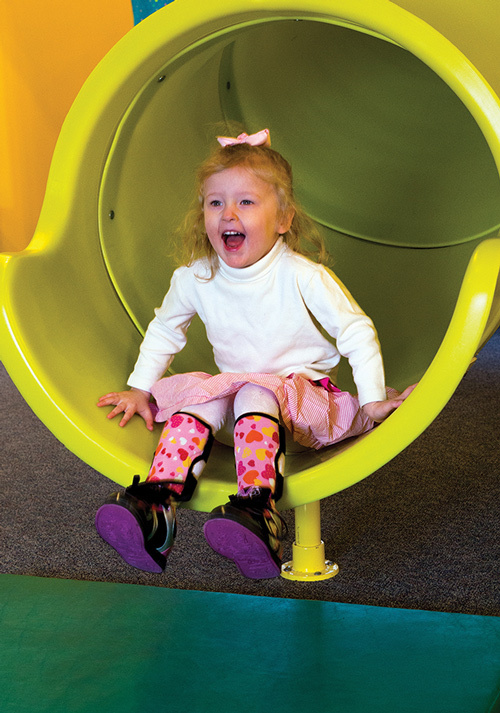 LER: Pediatrics spoke with O&P experts on how to handle these issues, including how to accommodate growth without compromising fit and function. While not a technical issue, patient and parent education is key to ensuring that everyone understands the purpose of a device and its projected longevity. Of course, all children grow, but as Davis pointed out, not all kids grow at the same rate, even during infant, toddler, and adolescent years, which are known for growth. And children who require O&P devices often have compromised skeletal systems and musculature because of their underlying diagnosis, and that may affect their growth schedule. Tony Wickman, CTPO, chief executive officer of Freedom Fabrication in Havana, FL, noted that bones tend to grow faster linearly than they do circumferentially. Unlike in adults, in whom changes tend to be more global, changes in kids may happen in a piecemeal fashion. For instance, a child may experience linear growth of the feet rather than medial-lateral growth, but without any major growth in the rest of the lower limbs. Davis agreed that linear growth is more of a concern in kids who may not build muscle mass as quickly as typically developing children. 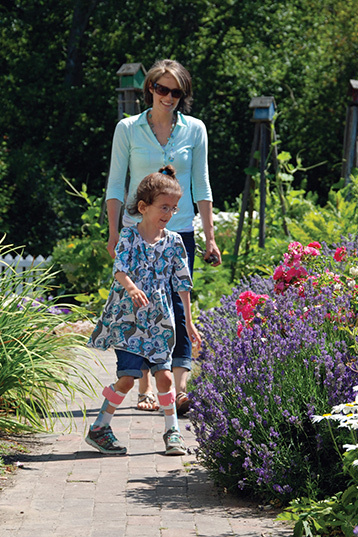 At the O&P service at Ann & Robert H. Lurie Children’s Hospital of Chicago, Nikta Pirouz, CPO, and colleagues make ankle foot orthoses (AFOs) for children as young as a day old. “Any presentation that requires an orthosis at that young an age requires a good fit even though these children aren’t ambulatory,” she said. Many children who require O&P devices have underlying neurological conditions that can impact their ability to understand the purpose of the devices, use them properly, and express when the device is causing discomfort, possibly because of a change in body habitus. Pirouz noted that standard clinical growth charts don’t really apply to kids who require devices, even if they don’t have underlying conditions. “Even for typical kids, those charts are an aggregate. The chart will tell me where the child will be in a year, but it’s not going to tell me exactly when that will happen for each individual child. A week from now? Over the summer? That’s why follow-up is so important,” she said. Finally, just as in the general population, childhood obesity is a problem in O&P patients. Pirouz pointed out that weight gain will most likely necessitate adjustments so that a device doesn’t pinch or dig into “redundant soft tissue.” But those adjustments don’t have to be complex. It’s not worth trying to fit a device for potential growth because it will compromise fit in the here and now, experts agreed. Davis concurred. For example, she said she wouldn’t typically build extra padding into an AFO that could be removed at a later time, because that can add bulk and compromise fit. She would leave the footplate a centimeter longer than the toes to accommodate for growth—but no longer, as that can cause problems with tripping or may require a shoe that’s a size too big. Footplate size can be misleading to parents as well, she said. “A lot of parents will rely on the footplate as a measure of growth. So if they wait [to replace the device] until the toes are hanging all the way over the footplate, then the height of the AFO becomes a concern,” she said. Pirouz agreed that achieving maximum fit and function in the present is paramount. Adjustments for growth can be made, but in the right context. Adding that extra centimeter to a footplate is just one of many tactics practitioners use to maintain a quality fit while also accommodating for growth. But no single approach will work well for all children. Wickman also cited diagnosis as a driving factor. But treating a condition like clubfoot is another matter, because the volume and circumference of the orthoses have to be managed in addition to the length, he added. LER asked the O&P specialists specifically about a number of common techniques. Leaving room to grow. Again, no one advocated a compromised fit for future growth. As Davis mentioned, she may leave a bit of room on an AFO footplate, but not at the top of the brace as it would hinder the child’s ability to bend their legs. Building extra width or circumference into a device also may compromise that device’s ability to control movement. “Most of the kids are going to have pretty serious frontal plane involvement, so you need to be able to control supramalleolarly,” Davis said. Infants grow very quickly so leaving room to grow can be tricky, Wickman said. “There’s an old adage in O&P about growth adjustment: ‘The more you need, the less you can have.’ Very small children are going to need a lot of growth adjustment, but if they are smaller, then we can’t build in a lot for growth because achieving the best fit doesn’t give us a lot of room to work with,” he said. Pirouz noted that pediatric devices generally don’t encapsulate the entire limb so allowances for growth can be made. This may mean using different interfaces to gain the best fit or using different tensions on the straps. Adding toe pads or removable liners. Davis and Pirouz said they did not use removable liners because of the bulk they add, but have used toe pads to increase the length of a device. Wickman acknowledged that removable liners can allow for extended device use in a growing child, but agreed that the added bulk and weight may not be desirable. Instead, he recommended using spot pads to cushion the bony prominences without adding bulk. Heating/flaring to increase volume. Increasing volume by heating is a go-to protocol for making adjustments, Wickman said, and today’s thermoplastic materials can withstand heating if the circumference of the device needs to be increased. Another benefit of using spot pads rather than full liners is that the latter can get in the way of heating the device, he said. Davis also supports heating to increase or decrease the circumference of a device, but she cautioned that doing so will also change the depth of the device in ways that could compromise its effectiveness. “If I heat it out and it makes [the device] wider, it’s not as deep as it used to be,” she said. Pirouz pointed out that it’s easier to maintain depth when decreasing the volume of a device than when increasing it. Screwed-on joints vs internal or riveted joints. In general, Davis advised positioning screwed-on joints on the outside of the device so the practitioner has the option to move the proximal section superiorly. With knee AFOs (KAFOs), she said she aims to build in the capability to bring the knee joint up for growth, whether that’s with Chicago screws or an attach plate. The use of growth adjustment bars will depend on the size of the child and how much weight he or she can tolerate, she added. In terms of adjustment bars, Wickman recommended stainless steel over aluminum as the former offers lighter weight but better durability, especially because active kids can be particularly rough on their devices. Stainless steel also will handle the stresses from repeated bending forces, for example in devices for genu varum or genu valgum, he said. Prefab vs custom. 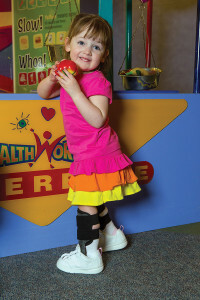 The use of off-the-shelf (OTS), or prefabricated, devices may seem like an attractive option for growing children simply because they are less expensive than custom devices. But other factors also come into play. Davis said her group does not use OTS devices very often in their pediatric population, in part because, in their experience, OTS devices aren’t always effective in kids who have triplanar deformities. For Pirouz, whether a device is OTS or custom is less of an issue than its material construction. On the other hand, an OTS carbon AFO may have such a low profile, and such limited contact with the anatomy, that it can accommodate circumferential or linear growth, Pirouz said. “Sometimes the referring specialist will just assume that a prefab device won’t work, and that’s not necessarily true,” she said. Education. While it’s not a technical issue, patient and parent education is key to ensuring that everyone understands the purpose of a device and its projected longevity. “A huge component of accommodating for growth is education—making sure the patient and the parents know what the device should look like when it’s properly fitted and when it may be time to come in for adjustments,” Pirouz stressed. Pirouz said she and her colleagues start with very short follow-up periods of one to two weeks to establish compliance and a schedule for wearing the device. After that, follow-up appointments are scheduled every one to three months, depending on the child’s age. “We always explain that we are shooting for the brace to last a year, but the priority is fit and function, so there is a chance that a new brace might be needed sooner,” she cautioned. Davis makes sure to take measurements every time the patient comes for a follow-up visit so, should a new brace be necessary, she’ll have the data to back up that request. It also can be reassuring to parents who are concerned about the cost of replacing a device sooner rather than later. On the other hand, practitioners may also find themselves contending with parents who will insist on a new device on a regular basis, especially if they believe that a newer device will work better and faster. Pirouz said that scenario is one she encounters more often than parents who are reluctant to get a new device. But if the desired clinical results are seen during regular follow-up, she said, then there may not be a need to jump immediately to a new brace. Shalmali Pal is a freelance writer in Tucson, AZ.